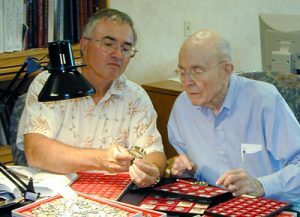 From an early age, Littleton Coin Company President David Sundman, left, learned coin collecting from his father, company founder, Maynard Sundman. Picture it: Father and son at breakfast. Talking sports. Or, about a yard project to make mom happy. Or, who will replace their favorite barber who’s just retired. But maybe they’re reading aloud – from Plutarch’s Lives. You know, that starter text for politicians and business tycoons. It compares famous Greek leaders to Roman: Theseus to Romulus, Pericles to Fabius Maximus, Aristides to Cato the Elder, Alexander to Caesar. Does the son understand civilizations born thousands of years before him? Does Dad help by giving him ancient coins to hold in his hands? From diaries and letters we know this is what happened between John Adams (JA), the man who would become our second president, and his son, John Quincy Adams (JQA), who would follow in his footsteps as our sixth president. Both shared an interest in the world’s oldest civilizations and collecting coins about them. Raised himself on Greek and Roman literature, JA was born in 1735 in the then-named Massachusetts Bay Colony where he became a lawyer and activist. As one of our Founding Fathers, he was part of a group of statesmen looking to Greece and Rome for examples that would help them design a balanced government. In addition to asking his son to read Plutarch’s Lives, JA raised him on the works of the influential Greek philosopher Plato, his equally prominent student Aristotle, and military genius Alexander the Great whom Aristotle tutored. The lives of these three men spanned a key time in the development of Greek Civilization, especially trade. One of the longest running coins to emerge – and survive – from this era was this Sikyonia (modern-day Sicyon) bronze coin with a dove. Hand struck and used between 500 and 146 B.C., its details are still visible after more than 2,000 years. It came from a region on the Peloponnesus peninsula that was famous for minting coins. Thanks to maritime commerce and military campaigns, the Greeks expanded their borders by trading with and then conquering ports that dotted the Mediterranean, Aegean and Marmara Seas. Remarkably still identifiable after all these centuries are the details on this ancient coin that most likely was used by merchants from 500 to 30 B.C. If you’re John Adams eyeing the future of a possible war between the American colonies and their British investors, could there be a better primer to have your son read than the chapter in Plutarch’s Lives featuring Alexander the Great? One of the greatest military leaders of all time, Alexander was the son of King Phillip II of Macedonia, located on the northeastern side of Mount Olympus. Alexander’s ambition would push Greece’s border as far east as modern-day India. 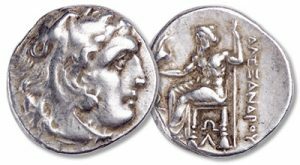 The year following his death in 323 B.C., this handsome silver drachm coin was introduced and struck by hand for 48 years until 275 B.C. Many believe the profile was either Alexander or the mythological demi-god Heracles, whom Alexander admired for his super-human strength. JA wasn’t just focused on biographies. In Roman myths, the father saw an opportunity to teach his young son – who was 10 when he was reading Plutarch’s Lives at breakfast – about codes of moral conduct. Fortunately for the youngster, some of those myths had coins connected to them. Here’s one example that also includes a father-son relationship: From A.D. 253-260, Gallienus and his father, Valerian, jointly ruled the Roman Empire. It was a turbulent period, marked by uprisings, unstable economics, and disease. As part of his prayers of petition to the Roman gods, Gallienus issued a series of bronze coins associated with real and mythical animals. Here is a Wild Animal Set featuring coins struck by hand more than 1,760 years ago and during Gallienus’s reign. The details are still delightfully legible! Another coin with a character-building story is this Gordian III Silver Antoninianus (Latin name for a coin used during the Roman Empire). Gordian III was Rome’s much-loved child emperor. Youthful good looks and a humble nature made him very popular with the Romans. At the age of 13, he was declared Caesar (a title given Roman sovereigns), and within months, was elevated to emperor. The sixth ruler of A.D. 238, he was the only child emperor not seduced by the power of Rome. Levelheaded and humble, he listened well to the advice of his elders, and under their guidance drove the Persians out of Mesopotamia. Putting together a collection of ancient coins with stories from long-ago civilizations can be an adventurous journey for a parent and child. If you want to discover more about these coins, check out the Ancient Civilizations Coin Club Littleton Coin Company maintains for collectors. The Great American Coin Hunt is on! This one takes the cake... ! Money Cake Tradition adds a fun new twist to your favorite celebration! Wrapping Up 2018 with a review of Local Interest Anniversaries! The ties that bind… How the NEW Innovation dollar is connected to the CLASSIC Buffalo nickel! Over 70 years ago, Maynard Sundman founded Littleton Coin Company on the time-honored values of courtesy, trust and providing quality products. Today, Littleton Coin is an employee-owned business, built by collectors, for collectors. Read more about Littleton Coin Company. © 2014- Littleton Coin Company, Inc. All rights reserved.